Esquisse of the epidemiological scenario of chagas disease in Brazil. Through the data from the Ministry of Health / SVS - Notification of Injury Information System (SINAN), the positive cases reported from January 2001 to December 2014 were identified with the objective of obtaining a quantitative description of cases by Federal Unit ) And Region of the country. The analysis of the data resulted in the largest number of cases in the Northeast Region, with a percentage of 42.5% of the cases, out of a total of 3,827 cases reported in Brazil over a period of 14 years. It was possible to visualize an advance in the fight against Chagas' disease in the country, with a significant decrease in the number of annual cases of the regions, except for the North region that presented an increase in the annual incidence of cases. Visceral leishmaniasis is a chronic disease of visceral manifestation caused by a protozoan of the genus Leishmania . The genus belongs to the family Trypanosomatidae, and the causative agent of Visceral Leishmaniasis (LV) in Brazil has been described as Leishmania infantum . They later described the causative agent of visceral leishmaniasis in the America as Leishmania chagasi, noting that Leishmania infantum is a different species of Leishmania chagasi [3,4]. LV is popularly known as Calazar being one of the most deadly diseases in the world. It is estimated that 200 to 400 thousand new cases of LV per year and that 6 countries including Brazil account for 90% of these new cases. The number of confirmed cases in Brazil each year is increasing, which is a concern for public health, an opinion of the Ministry of Health 5 reports the increase in LVH lethality from 3.4% in 1994 to 5.5% In 2008, an increase of 61.8% in this period. In Brazil, approximately 90% of the reported cases of Human visceral leishmaniasis (LVH) in the 1990s occurred in the Northeast region. Over the years, the disease spread to other regions. In 2010, the Northeast had 48% of the national cases . Protozoan parasite obligatory intracellular that needs to complete its life cycle in two types of hosts. One of the hosts is an invertebrate belonging to the Family Psychodidae, Subfamily Phlebotominae, being in Brazil of the genus Lutzomyia longipalpis known popularly as a straw or birigui mosquito, this one presents in its digestive tube the flagellate form of the protozoan 6 known as Promastigota, and the second host is a mammalian vertebrate, being the human and domestic dog (Canis lupus familiaris) . In the state of Mato Grosso do Sul, wild animals naturally infected with Leishmania chagasi were found: opossums (Didelphis albiventris), foxes (Cerdocyon thous) and foxes (Lycalopex vetulus) . In Brazil the main transmitter is Lutzomyia longipalpis popularly known as straw mosquito or birigui . It is a hematophagous diphtheria that when feeding the prey, in the case the susceptible mammalian vertebrate host regurgitates along with the saliva the protozoa in the promastigote form. Once inoculated into the animal, this protozoa may invade mainly the macrophages, thus hiding itself from the other cells of defense. When the macrophage phagocytes the flagellated forms, they are not destroyed, transforming later to the amastigote form, non-flagellated forms. These forms can reproduce inside the cells by binary division, increasing more and more the amastigote forms of the protozoan, until breaking the macrophage wall falling into the bloodstream and infecting new cells . There are no confirmed cases of direct transmission in humans, that is, from person to person. The protozoan needs to complete the 2 life cycles, respectively in the invertebrate and mammalian vertebrate, in order to be transmitted by the vector to the human. The disease is characterized mainly by irregular fever, weight loss and enlargement of the liver and spleen. The diagnosis of LVH is confirmed in the laboratory, through clinical and laboratory analyzes, consisting of parasitological tests for identification of the protozoan and immunological tests. According to the Brazilian Society of Tropical Medicine, the vaccine for Leishmaniasis in humans is still something futuristic and that the vaccine against Canine LV is in a way much more efficient for the control of the disease . As for the treatment, two main drugs are used in Brazil: a pentavalent antimonial and Amphotericin B. The Ministry of Health 5 recommends N-methyl Glucamine Antimonate as the initial drug for the treatment of LVH . This is a retrospective descriptive research aimed at collecting epidemiological data regarding LVH in the period from January 2003 to December 2013. Values collected from the online database of the Ministry of Health/SVS - Notification - SINAN, aiming at the schematic presentation of the number of confirmed cases in the period stipulated in the federative units of Brazil. The results were filtered by specific year of infection occurrence and Federative Unit (UF), later worked on Excel 2010 spreadsheets. The collection of retrospective epidemiological data is important for the epidemiology of the disease to be mapped, reporting the regions that present confirmed cases and the most endemic states, allowing later work on these data. As shown in Table 1, the Central-West Region had the state of Mato Grosso do Sul with the highest 37 number of cases, 2,644 (67.2%). In the Northeast, the state with the highest number of cases was Ceará with 5,190 cases, representing 24.7% of the total number of confirmed cases in the region. In the North, the states of Tocantins with a total of 3,838 cases and Pará with a total of 3,471 cases, representing respectively 51.4% and 46.5% of the total cases in the region. In the Southeast Region the state with the highest number of cases was Minas Gerais with a total of 5,270 (66.6%) followed by the State of São Paulo with 2,552 (32.2%). Southern Brazil is the region least affected by the disease, the state with the highest number of cases was Paraná with 28 (62.2%). Table 1: Confirmed cases of Human Visceral Leishmaniosis in Brazil (2003-2013). Brazil presented a total of 36,658 cases and the most endemic region is the Northeast, with 21,049 (47.14%) of the total number of confirmed cases in Brazil, Figure 1 shows the concentration of confirmed cases in each Federative Unit with a schematization Of the climatic map of Brazil from Köppen-Geiger. 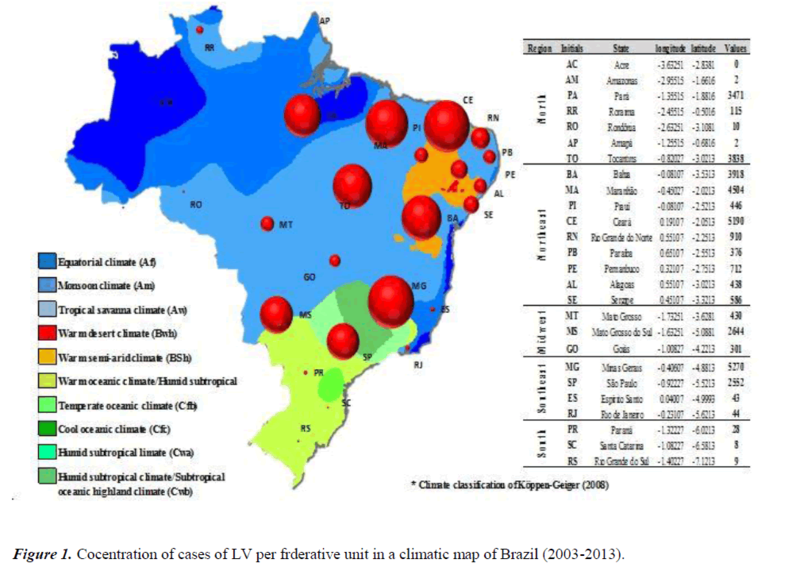 Figure 1: Cocentration of cases of LV per frderative unit in a climatic map of Brazil (2003-2013). Brazil is among the most endemic countries on the planet in relation to LVH. The fact that this disease is an anthropozoonosis justifies its difficult control since, among the population we have a culture installed for many generations, in which the creation of dogs in the home environment. It is often regarded as an animal guardian of the house or even a family member. The point to think about is the 3 aspects necessary for the installation of LV; Firstly, the presence of man and the dog is emphasized, but what leads to the occurrence of cases is precisely the presence of the peridomiciliary environment. Some regions of Brazil have shown an increase in the number of LVH cases, which shows an advance of the disease in the country, a clearer way of seeing this is in the tabulation of epidemiological data confirmed in the country, to complement this study and to prove the increase in Disease in the country, a survey carried out by the Ministry of Health 11 found in 19 years of notification (1984-2002) a total of 48,455 cases of LVH confirmed in Brazil. The epidemiological situation of Brazil in relation to the number of cases analyzed in the period 2003-2013 is superior to the data demonstrated in the epidemiological survey carried out by the Ministry of Health of 1984-2002. Control and awareness measures are necessary, mainly for the knowledge and combat of the vector, a measure homologated to combat dengue. For the reduction or population control of these vectors provides the reduction of new cases. ROSS R Further notes on Leishman's bodies. Br Med J 1903; 2: 1401. Nicolle CJ. Three cases of infantile spleen infantile with Leishman's body observed in Tunisia. Arch Inst Pasteur Tunis 1908; 3: 1-26. Cunha and ChagasExperimental infection of Equus asinus with Leishmania chagasi (1937). Rev Soc Bras Med Trop 2003; 36: 695-701. World health organization. Maps showing the geographical distribution of leishmaniasis World Health Observatory (GHO). Sheet leishmaniasis, No. 375. 2010 Ministry of Health. Department of Health Surveillance Department of Epidemiological Surveillance. 2006 Ministry of Health. Secretariat of Health Surveillance, Department of Epidemiological Surveillance. Manual of surveillance and control of visceral leishmaniasis. Brasília, Brazil, 2006. Bonamigo RA, Oliveira G.Parasitological diagnosis of leishmania sp. In wild animals. Gontijo CMF Visceral leishmaniasis in Brazil current framework, challenges and perspectives. Rev Bras Epidemiol 2004 ; 7. Castellano LRC Anti-Leishmania immune response and evasion mechanisms. VITAE. 2005; 12. SBMT - Brazilian society of tropical medicine, news: "Vaccine against the different types of Leishmaniasis is still far from being reality." Brazil. Ministry of Health - MS. Department of Epidemiological Surveillance: Manual of Surveillance and Control of Visceral Leishmaniasis.